2019 is not only a new year but a new opportunity to get your Grange into the eyes of your local community. Here are some tips to keep in mind when planning out your upcoming Grange year. • Is your community aware that your Grange exists? Don’t be afraid to tell your Grange story. Granges have a number of sources available to promote their events, programs and activities - such as press releases to the local media, social media outlets like Facebook, and more traditional methods like posters, signage, and even face-to-face and telephone communications. But when promoting your Grange, are you telling its story? How many years has your Grange been organized? Are there specific projects/events that your Grange is known for (like your Fair, Bazaar, Dairy Dinner, Community Service projects, etc.)? Be sure to take every opportunity to tell your Grange story. It can be as easy as a paragraph at the end of a press release, a “throw-back Thursday” photo posted to Facebook, or a line at the bottom of poster. • Take a proactive approach. Don’t wait for publicity to come to you. Media outlets have hundreds of organizations just like the Grange vying for space and airtime. Chances are, they will not just stumble upon your Grange and promote it - you have to initiate the contact. Invite the media to a Grange meeting or event. Send a quick e-mail to your local newspaper promoting your upcoming activities - just be sure to give them at minimum 3 weeks notice. Even a quick phone call can be the difference between press coverage versus no press coverage. • Don’t be overwhelmed. Simplify your approach and cut through the clutter. Promoting your Grange can be overwhelming when you don’t know what direction to turn first. You have a list of newspapers, a Facebook Page or a website you are not comfortable using, and no real computer skills to speak of - so where do you start? Begin by taking a step back, and selecting one path on which to concentrate your efforts. Once you feel confident in writing press releases, then move on to adding Facebook to the mix. Then proceed to a website. Try taking a computer class to learn the basics. Most towns offer beginner computer classes either for free or for a small fee through adult ed or in senior centers. Look into your options, take it one step at a time, and eliminate the frustration. • Stay organized and be prepared. In order to go the extra mile when promoting your Grange, you need to be knowledgable of the organization, ready to answer any questions that may arise, and be armed with the details. When writing your press releases and announcements, try to include as much relevant information as available. This includes writing your Grange column for the Connecticut Granger. We’ve all read the reports that announce the Grange’s latest fun event, but leave out important details, like time and cost. Don’t let the reader guess - tell them everything they need to know upfront. Staying organized is the key to success. Keep a log of when you submit press releases, and set reminders in your calendar for follow-up. Schedule your Facebook posts in advance, so that your page is updated consistently. Create a folder in your e-mail to save important messages avoiding accidental deletion. Keep print-outs in a 3-ring binder of your publicity efforts for each event. No matter the method(s) you choose, effective organization efficiently creates the best results. Public Relations and communications can play an integral part in your Grange’s journey. Be sure to utilize available resources and most importantly, set achievable goals to build toward. Need more information, or would like a hand in getting started? Drop us a line. We’re here to help! 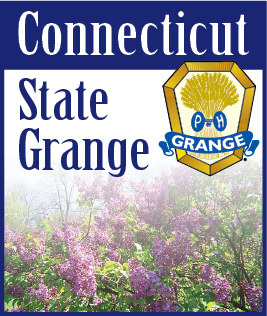 E-mail: publicrelations@ctstategrange.org or information@ctstategrange.org.